Manchester Crown Court was told that Steven Wailey, a HGV driver employed by Alex Sharples Farm Supplies and Transport (ASFST), was backing into a parking space at Sandywood Industrial Estate on 7 May 2014 when he hit Danny Adams, 63. 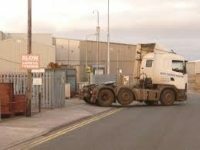 Adams was the owner of D Adams Haulage Contractors and he rented part of ASFST’s yard to park two of his vehicles. He was crushed between the back wheel of his own vehicle and the rear of Wailey’s lorry and was taken to Salford Royal Hospital, where he died of internal injuries two days later. The Health and Safety Executive (HSE) investigated the accident. It found that ASFST had no safe system of work for reversing HGVs and failed to segregate vehicles and pedestrians. It provided no training for its drivers and there were no banksmen on site. ASFST pleaded guilty to a breach of s 3(1) of the Health and Safety at Work Act. It was fined £30,000 plus £14,000 costs. After the hearing, HSE inspector Ian Betley said the accident was “caused by the failure of the host company to implement safe systems of work, and failure to ensure that health and safety documentation was communicated and followed”.